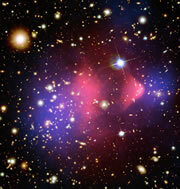 The centers of mass of these galactic clusters (blue) are offset from the massive gas clouds (red). Dark matter might be the cause. Dark matter definitely exists -- or does it? The dance goes on. Some say potahto -- and some say potayto -- let's call the whole thing off. Personally I like the versions where nothing is known for certain. It lends a certain shivery frisson to the whole question of the riddle of the universe and makes us wonder as we gaze up to the heavens in awe. Or could be the dark matter is just composed of all those lost black socks that disappear from the washer never to be seen again. news @ nature.com�-�Dark matter spied in galactic collision�-�Galactic crash reveals mysterious particles. The great thing about this, is that you can say that dark matter does exist.